You hear a lot of claims that, once you include manufacturing and battery replacement, hybrids pollute more than an efficient, more conventional engine. Are there any end-to-end studies measuring any type of pollution for both types of vehicles, which demonstrate that one is superior, even when the manufacturing (and pollution to generate electricity) is included for consideration? Note, I'm not talking about comparisons to Hummers. Pollution to include CO2 and other emissions commonly attributed to and regulation in relation to the combustion of gasoline in motor vehicles. The five-vehicle test is demonstrating the long-term durability of Nickel Metal Hydride batteries and of electric drive-trains. Only slight performance degradation has been observed to date with the highest mileage vehicles. Test data provide strong evidence that all five vehicles will exceed the 100,000-mile mark and SCE’s positive experience points to the very strong likelihood of a 130,000 to 150,000-mile battery and drive-train operational life. This is achieved by full or mostly full range use after every charge. EVs can therefore match or exceed the lifecycle miles of comparable internal combustion engine vehicles. As such, the reduction of greenhouse gases is simply a net benefit for the environment. However, you asked for lithium-ion batteries. That makes the answer harder to answer. Lithium-ion batteries are used in hybrid cars since only very recently. Little information is available on the subject. Battery-powered electric cars (BEVs) play a key role in future mobility scenarios. However, little is known about the environmental impacts of the production, use and disposal of the lithium ion (Li-ion) battery. This makes it difficult to compare the environmental impacts of BEVs with those of internal combustion engine cars (ICEVs). Used a car more energy efficient than the average car sold in Europe in 2009. They used 5.2 L of gasoline per 100 km, instead of 5.7 L of diesel /100 km 6.6 L of gasoline /100 km. "All expenditures for the exploitation of the lithium salts were allocated to the lithium salts, even though the saline brine yields other byproduct as well." All the burden from production are allocated to the first life of each product even though the product might be reused or recycled. As explained in the study, this assumption heavily penalizes BEVs since recycling of electric batteries is high and since recycling of lithium is more energy efficient than production of it. All the facts taken together, the results of the LCA, the various sensitivity analyses, the modeling applied for EOL, the assumption for the used electricity mix, etc., suggest that E-mobility is environmentally beneficial compared to conventional mobility. 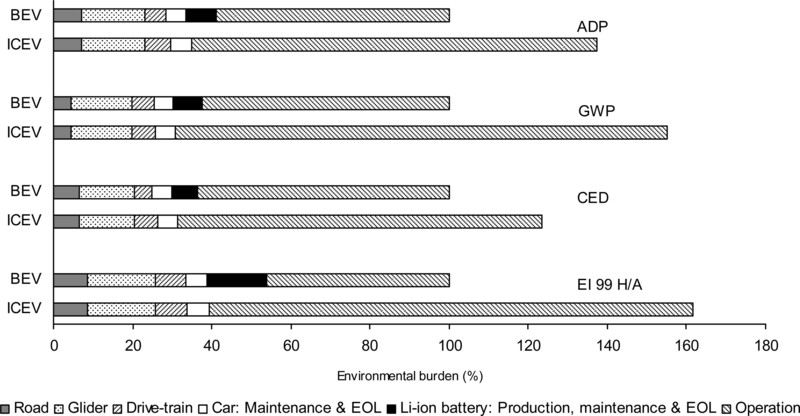 The Li-ion battery plays a minor role in the assessment of the environmental burden of E-Mobility. Thus, a Li-ion battery in an BEV does not lead to an overcompensation of the potential benefits of the higher efficiency of BEV compared to an ICEV. A break even analysis shows that an ICEV would need to consume less than 3.9 L/100km to cause lower CED than a BEV or less than 2.6 L/100km to cause a lower EI99 H/A score. Consumptions in this range are achieved by some small and very efficient diesel ICEVs, for example, from Ford and Volkswagen (13, 39). They also note that the means by which the energy is produced influences the how environmentally-friendly BEVs are. The study used the average electricity production mix in Europe to give a general idea. If electricity comes from "an average hard coal power plant", the environmental burden is increased by 13.4%. On the other hand, if the electricity comes from hydropower plants, the environmental burden is decreased by 40.2%. As such, as countries move toward green energy, the environmental burden of electric cars will decrease. The study does not address the cost of manufacturing the automobiles, but those costs are not significant. As a recent Argonne National Lab study concluded that, while hybrid cars cost more to produce, hybrid cars make up for their greater manufacture energy costs by being more environmentally-friendly on the road - especially if recycled materials are used in the vehicle's fabrication. The energy use and GHG emissions that result from vehicle production and disposal of advanced-powertrain vehicles (HEV and FCV) may be greater than those for ICEVs because of (1) the use of energyi-ntensive materials in the fuel cell system of the FCV, and (2) the increased use of aluminum in both the HEV and FCV. However, the use of recycled materials can reduce these impacts. Conversely, the use of energy-intensive materials such as aluminum and carbon fiber composites does not necessarily increase the vehicle-cycle energy use and GHG emissions of lightweight vehicles; with a reduction in total weight, the results are about the same and could be improved with additional recycling. To put vehicle-cycle results into a broad perspective, we conducted a total energy-cycle analysis that included the vehicle-cycle, fuel-cycle, and vehicle-operation stages. Our vehicle-cycle analysis revealed that lightweight materials can reduce the weight of a vehicle and improve its fuel economy, but that production of these materials can be energy intensive if recycled materials are not used. Our total energy-cycle analysis further shows that, when examining vehicle technologies and lightweight materials on a total energy-cycle basis, there can be a significant net benefit in terms of energy use and emissions reduction by substituting lightweight materials for conventional materials. This article explains that if the goal is to reduce aggregate gasoline consumption, the most savings is found by spreading smaller batteries over more cars, rather than larger batteries over few cars. This is because a scarcity of battery materials limits production. The greatest savings-per-battery-materials comes from upgrading a gasoline car's battery such that it can handle the strain of turning the car off every time it stops. Upgrading N cars with such batteries saves more gasoline than upgrading proportionally fewer cars as hybrids or electrics. Even if you'd disregard how much pollution is created while making batteries, just the fuel efficiency of hybrid cars is actually much worse than that of modern eco-turbodiesel. Especially VolksWagen's BlueMotion (aka EcoMotive in SEATs and Greenline in Škodas) line of engines is exceptionally fuel efficient. Fuel efficiency translates to less pollution. Not the answer you're looking for? Browse other questions tagged environment road-vehicles . Are Hummers more environmentally friendly than Prius? Does a car tire require 26 Liters / 7 US Gallons of crude oil to manufacture? Do you need to break in new engine on a car/bike for first 1,000 km by driving slowly and otherwise following manual's advice? Shouldn't an electric car be thermodynamically at a disadvantage towards one with a combustion engine? Do modern turbo-diesel car engines fail significantly more often than gasoline ones? Does an old car with engine turned off pollute more than a new car going 60 mph? Is the self-driving car technology of 2017 less lethal than human drivers?